Unique, Experiential Theatre in "Oh Guru Guru Guru"
Rebecca Hart in O Guru Guru Guru. Photo by Alan Simons. I’m not a big fan of lectures in the theater as a device, even a poetic emotionally charged lecture like the one that opened Oh Guru Guru Guru the other night at the Humana Festival. 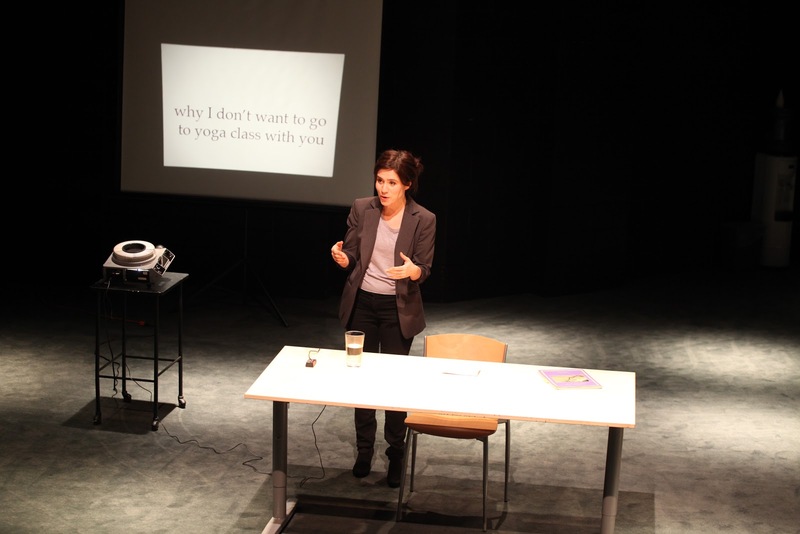 The lecture feels long, and it is long; and there is no program to assure you, the audience, that no, this is not a one-woman lecture about a woman’s childhood adventures in yoga. I am here to assure you: it’s worth it. Just relax. Lila’s lecture is about why she can’t go to Yoga class with you (me, us). Lila grew up immersed in the world of Yoga in an ashram in India. Her parents were Yogis. She loved Yoga, and she wanted to be like Gurumayi, the spiritual leader of the Siddha Yoga path. The lecture is peppered with stories about her life in the ashram. Then the stage opens on a yoga session in India where the women wear beautifully colorful saris and chant to sitar music. The audience is invited to remove their shoes and sit on the stage, where they are taken through the yoga process led by a confident calm instructor. Young women share the lessons they have learned from the guru. The audience becomes a part of the session in which Lila is in attendance. There is a performance of shadow puppets. The visuals of the piece are theatrical and out of the ordinary. Everything seems a little too nice, however – a little too separated from the real world to feel genuine. Then, the set shifts again, to the movie set of Eat, Pray, Love, a Julia Roberts film. Lila is an extra in the film and meets Ms. Roberts and admits to an existential crisis. She no longer believes in the things she was taught as a child, but she doesn’t really feel she has anything else. The shape of this play is what’s unique and cool about it. It makes sharp turns, without stopping to explain itself. It’s like the unfolding of a mural, frame by frame, as it doesn’t really make sense as a whole until that last piece is revealed. I wish I had trusted the author a little more. I found myself slightly uneasy, as I couldn’t quite grasp the direction of the piece. Maybe that was the job of the author, or maybe not. What comes full circle, however, is surprising and lovely and very modern in its sensibilities. Rebecca Hart as Lila is deceptively vulnerable while appearing at first confidently together. She does such a graceful salute to the sun for Julia Roberts, in one particular moment, that I’m still thinking about it two days later. 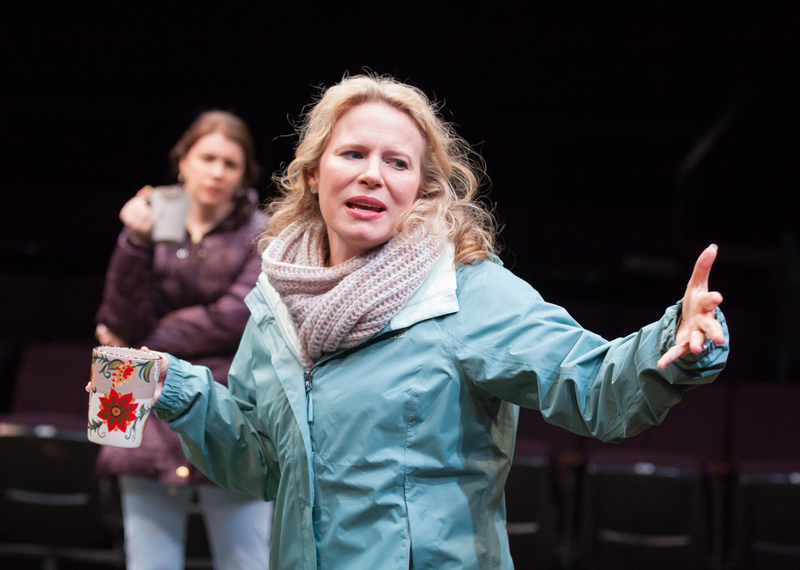 The themes of Mallory Avidon’s play are simple and universal: a young woman has become disillusioned with her heroes and her passions, and so has to find a way to move forward. There is a deeply felt irony in the story of a childhood spent searching for enlightenment only to emerge into adulthood in a state of complete confusion. Most of us arrive there with no experience in Yoga to speak of. What was the point, Lila wonders? If her heroes too must fall so hard, where does that leave her? This play is fun, modern, but not alienating. It’s experiential, but in the best sense. And there is tea in the lobby at the end after you put your shoes back on. PreviousWaking Dream Takes Four Years to Realize: Behind the Scenes of "Sleep Rock Thy Brain"